Cooking and vegetable oils and their greasy residues can pose a pretty big hazard to your clothing. The stains may not look like much since they aren't bright or obvious. Instead, oil stains tend to slightly darken the fabric in the areas they stain. Unfortunately, getting those fibers to let go of the oil can be a little tricky. It doesn't help that once a stain dries, it can permanently set into the fabric. 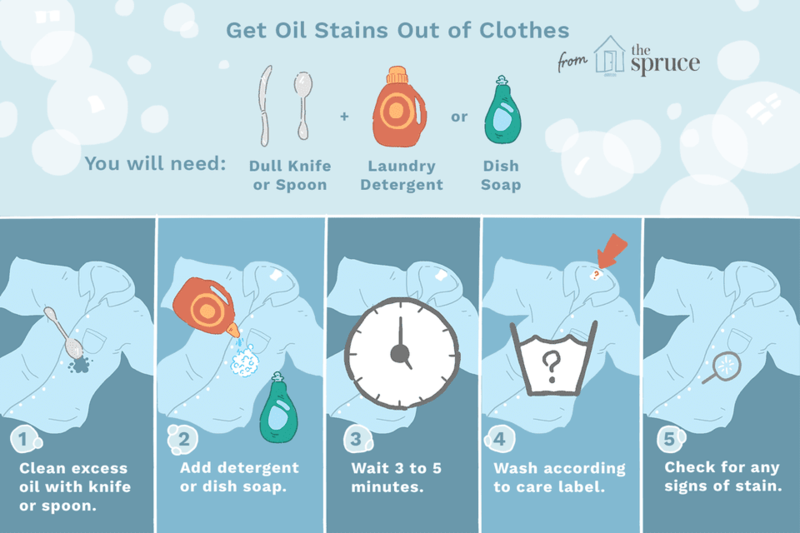 ​The key to getting out oily and greasy stains is to wash clothing in the hottest water that is safe for the fabric and do it as quickly as possible. Take the garment to your laundry area. Remove as much excess oil as possible with a dull knife or spoon. This will make it easier to treat the stained area of the fabric. It will also prevent any oil from seeping into other parts of the fabric, creating new areas that need to be treated. Apply liquid laundry detergent to the stained area. Most liquid laundry detergents are able to remove grease, but for tough stains, you may need to try a liquid dish soap. Put enough on the stain so that it soaks through both sides of the fabric. Allow the liquid to sit for at least 3 to 5 minutes. This will allow it to seep completely through the fabric. As it soaks into the fabric, it will begin to break down the grease. You can let it sit for up to 10 minutes, but don't let the area dry. Check the clothing tags to determine what water temperature to use. Wash in the hottest water safe for the fabric. The warmer the water, the easier it will be for the oil to be fully cleaned. After washing, check to make sure the stain is removed before you dry the clothing. If any hint of the stain still remains, repeat the previous steps. Allow the clothing to air dry to make sure there is no hint of a stain or darkened ring in the area. If there isn't, the clothing is safe to wash and dry normally. If any stain remains, you'll need to repeat the steps above. You can also use a good basic dish soap to get cooking oil stains out instead of laundry detergent. The fancier dish soaps that are easy on your hands may not be as effective since they may contain lotion or other additives; look for one that promises to remove grease. Instead of washing the entire garment in hot water, try using hot running water just on the part of the clothing that is stained after you treat it with laundry or dish soap. Then wash normally. Always read the clothing tag first as some fabrics can be damaged by very hot water.